So Star Trek: The Next Generation is now 20 years old (which probably makes it just a little bit last generation …) and CBS and Simon & Schuster take this anniversary as an opportunity for releasing a couple of TNG-related books. The first one I got is Star Trek: TNG: The Sky’s the Limit. 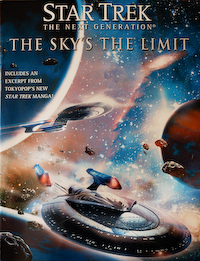 The Sky’s the Limit is a collection of short stories spanning the whole timeline of TNG so far, starting with a story about what happened to make Picard the captain of the Enterprise-D up to right after the most recent movie, Star Trek IX: Nemesis. One of the tales lets you meet Dr. Pulaski from the second season again while another helps you see the world through the eyes of an underestimated warrior aboard the Enterprise: Spot. In general I found the mix really good but on the other hand some of the stories might appear a little bit too short which results in some quite clear cuts. This is also the only complaint I can think of right now. Some of the stories were nice enough to have them take just a little bit longer and they definitely brought back a kind of Star Trek flair I haven’t seen in a book or ST-show/-movie for years.